We’re in a private meeting with an old acquaintance. Now children, ask yourself what day is it today. Look at your calendar. September 15, right? So, who else would we be in a private meeting with? With Professor Robert Langdon, of course. 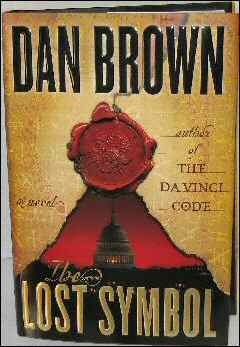 Like millions of readers worldwide, zombie-like we dutifully trooped over to the nearest bookstore and got our copy of popular author Dan Brown’s new book The Lost Symbol ($17.27 at Sam’s Club) this morning. The New York Times reports that the 509-page book is flying off shelves. No surprise here, considering Brown’s previous book The Da Vinci Code sold 81 million copies, was translated into 41 languages and also made into a movie featuring Hollywood star Tom Hanks. For Christ’s sake, we’re talking of the Robert Langdon, Professor of Symbology at Harvard University. The only man who can make sense of all those esoteric ancient symbols and odd characters, those that would stump lesser intellects. Yes, we’re talking of centuries-old symbols and characters that still have an echo in the contemporary world. This time, the setting is Washington. Of course, there’s a secretive organization in this book too. Here, it’s the Freemasons. Now will y’all please leave us alone for the next 12 hours or so until we return from our wild ride with Prof. Langdon. 7 Responses to "Do Not Disturb; In a Private Meeting"
Ok guys, awaiting reviews from you on this one. I found his Angels & Demons to be much better than his Da Vinci. Dan Brown is usually, to use an Indian expression, Paisa Vasool (value for money). Must have released in your country too, right? I hope they do not make a movie (A bad one like Da Vinci code) out of this book too!!! Yeah it did. Was selling like hot cakes here. Hei,have you read The Rule of Four? I haven’t read it but it was doing well same time as Da Vinci Code over here. No. It should there in our local library. Will pick it up one of these days. So where is the review for this? I have that book, its a more intellectual version of DVC, not much of action, twists, more of theorizing. The best in that genre however would be Umberto Eco’s Focault’s Pendulum, very complex and layered. Focault’s Pendulum has been described as the thinking person’s Da Vinci Code. found it average when compared to davinci code and angels. The plot sometimes is predictable, especially that tamil cinematic twist at the end ( i predicted halfway through the novel ), but still it is an interesting page turner and educative about symbols. We’ll do a full review asap.